If you haven't been to Julian yet this fall, this weekend is a great time. We've got classic fall weather in the forecast, plenty of live music all over town and Julian apples are still being sold at the apple stands (some U-picks are sold out). The Lacemakers are here at Wynola Farms Marketplace this Sunday at Noon and all our shops will be open for business, wine and hard cider tasting and your browsing pleasure. I just talked to Dale here at Wynola's Daily Perc and, although he didn't say exactly what, he's got some fun food planned for Sunday's BBQ. The Lacemakers are a really fun band to see. 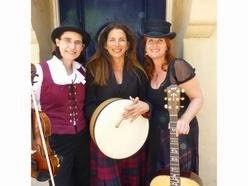 Plenty of three part harmony, an abundance of traditional instruments, and a good-time/old-time feel to their original songwriting. Don't miss it!